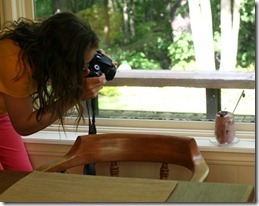 Last June, my blog buddy Ashley came for a visit! It was our first time meeting ‘in real life’. I was nervous and basically had hot flashes anticipating her arrival. We bonded over foodie gifts..
Oh, and nut butter. It was on this visit that Ashley gave me some of her Maple Cinnamon Almond Butter and Salt-Kissed Cashew Butter. Before then, I was always a Homemade Raw Almond Butter kinda gal, but she inspired me to experiment with other homemade nut butter flavours! Clearly my nut butters are simply another vessel for chocolate. I blame PMS. Yesterday, I made a spin-off of Ashley’s Vanilla Bean Maple Almond Butter. It was also inspired by Naturally Nutty’s Cinnamon Vanilla Almond Butter made with chia, flax, and hemp seed that I spotted on Kath Eats. I thought the idea of adding chia, flax, and hemp seed was a great way to sneak in more nutrients. And I’m totally down for anything that gives me another reason to eat nut butter! This is easily the most delicious almond butter I've ever tasted! The secret to this incredible nut butter is to coat the almonds in maple syrup, hemp hearts, chia seeds, and flaxseeds, and then roast it all until fragrant and golden. After processing for about 5 to 10 minutes, it turns into the creamiest, "drippy" nut butter ever. I love adding a healthy portion of cinnamon, fine sea salt, and pure vanilla bean powder (or extract) to take it over the top. You'll be enjoying this spread straight out of the processor bowl—I can promise you that! I recommend using a heavy-duty food processor when making nut butters; the smaller machines just don't have the power to do the job and might burn out. Preheat oven to 300°F. Line a baking sheet with parchment paper. In a large bowl, mix together the almonds, flaxseeds, hemp hearts, chia seeds, and maple syrup until combined. Spread the almond mixture onto baking sheet in an even layer. Bake for 30 minutes, stirring once halfway through. Remove from oven and allow the almond mixture to cool for 10 minutes before placing into a food processor. Add the almonds into the food processor along with the coconut oil. Process for about 5 to 10 minutes, stopping to scrape the bowl every 60 seconds, or as needed. (Be sure to leave the processor chute uncovered so the steam from the almonds can escape.) The mixture will be very drippy and smooth when ready. Add in the cinnamon, salt, and vanilla and process until combined. 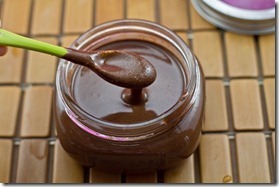 Remove the almond butter and store in a glass jar or a container with an airtight lid. If the almond butter is still warm, allow it to come to room temperature before securing the lid. Recipe makes 1 1/4 cups total. 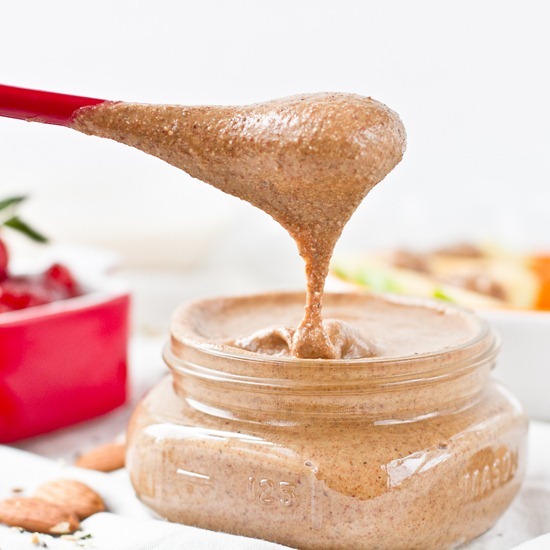 Have you ever made homemade nut butter before? It is really quite easy if you have a processor or blender that will do the work. This recipe requires more time than any nut butter recipe I have made before (due to the almond roasting), but it was so worth it in the end! Mix together the almonds, chia, flax, hemp, and maple syrup. Spread out onto a lined baking sheet and bake for 30 minutes, stirring once half way through, at 300F. Eric came into the kitchen when I was making this yesterday morning and he said, ’Mmm it smells amazing in here! WOW! When I told him that I was making nut butter, he was crushed (he hates nut butter). He thought I was making waffles! For the first 5 minutes of processing, stop and scrape down the bowl every 30-60 seconds as needed. In the initial stages, I stop every 30 seconds or so. After 5 more minutes of processing, my nut butter was ready! I added in the cinnamon, salt, and vanilla around minute 9. I won’t tell you how much fun licking the bowl is. That would just be mean. It makes about 1 and 1/4 cup. The result is an almond butter with a deep roasted flavour and layers of nuttiness with just a hint of sweetness. I didn’t detect the chia, hemp, or flax flavours specifically, but I was happy knowing they were in there! I enjoyed some apple slices spread with nut butter and strawberry jam. If you’d like to make chunky almond butter, you can process or chop some almonds and then stir it back into the almond butter. I think I will try that next time! Does anyone know if I can make nut butter in my Vitamix without a DRY container? I’m scared to ruin it! Dont you love when you meet new peeps and hit it off!!?? Love the pics of you two taking pics. That first shot– geez Louise!!!! 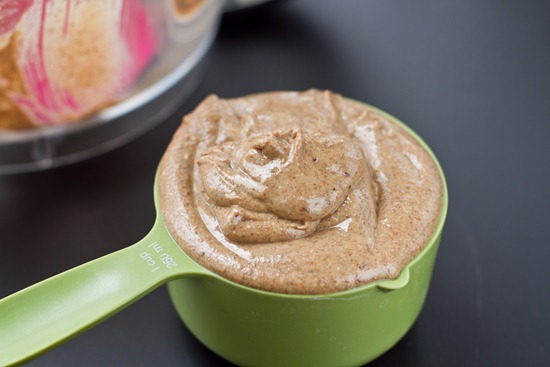 This nut butter looks downright luscious! Funny, I made nut butter this weekend and was wondering if adding chia seeds would work. Now I know for next time! maple! cinnamon! almonds! flax! hemp! chia! sorry. I’m a bit excited — these are a few of my favorite things, combined into one lovely spread. I would love some, right now, just a whole jar to myself to graze on all day. I can’t believe Eric doesn’t like nut butter! Craziness! At least he likes chocolate right? Isn’t it nice to just hit it off with someone right away? That is so great! The nut butter looks amazing — I’ve never tried Naturally Nutty but they have the most interesting flavors! Gorgeous nut butter photo. Wow! I love your nut butter recipes! This nut butter sounds absolutely divine! And I love how it’s got so much good stuff packed in there! Fabulous!! Oh yum. I think adding flax into nut butter makes it a million times better. And I love the maple addition. That little bit of sweet tastes great, I bet. I made cashew butter in my standard Vita-Mix container, and it worked really well! I blended JUST cashews– no additional oil or anything– on LOW, and used the tamper to push down the cashews until it was butter-like. I tried the same thing with almonds… and had little success. I didn’t burn-out my blender, but additional oil would have been a good idea! ahhh yea that is what scares me! But almond butter works just fine in my vitamix! I make all my nut butters in the vita dry container- no oil or anything. Looks incredible! 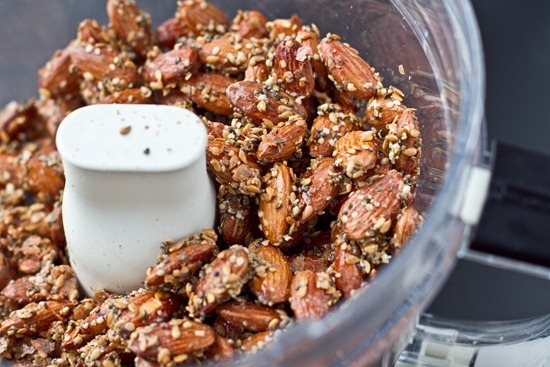 Interesting that you baked the nuts and seeds before adding them to the food processor. I probably would have just thrown them in raw. Any difference? baking them gives the nut butter a really nice roasted flavour, although Im sure you could make it raw if you prefer! This nut butter sounds so good! I love anything with maple syrup & anything with cinnamon… and now they are both in a nut butter! Have to try! I’ve never tried making my own nut butter, but it’s definitely on the to-do list since I have a high-quality kitchenaid food processor. 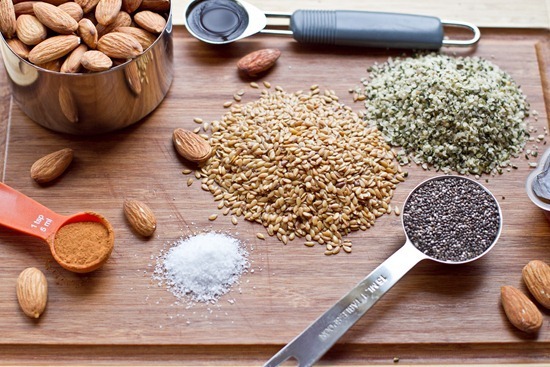 This recipe sounds fantastic Angela – I love all the seeds! Wonderful photography as well! I NEED to get a food processor that won’t break on me while trying to make nut butter! I’ve toasted two of them so far and am scared to buy another :( Any suggestions?? Me too. I need to buy a processor and would make lots of butter in it as well so I’d be curious to know what processor you use also Angela? Thanks! OMG that looks yummy! How did those almonds even make it into the food processor! AMAZING! 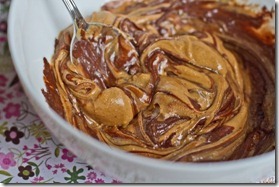 I’m such a fan Naturally Nutty peanut butter; great idea to make your own version. So much cheaper! I will definitely be trying this goodness! Thanks for another GREAT recipe! Where do you get all of your cute jars??! The cute little mason one at the top of your post. So cute, I have a hard time finding jars! YUM!!! I bet it smells amazing! I’d be licking each and every one of the spoons that’s in the pictures, LOL. I really regret not having nut butter at breakfast now that i’ve seen these pics. 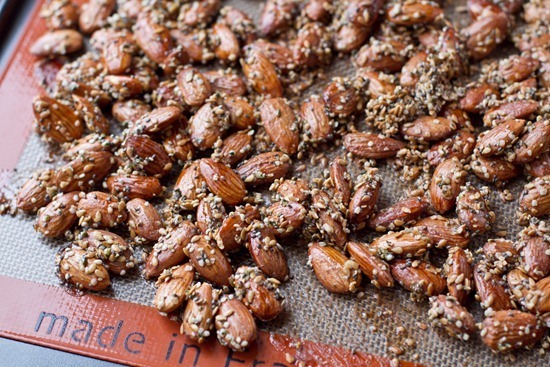 Great idea adding the seeds and roasting the almonds. I’m going to be thinking about this all day! This may be what it takes to get me to go buy a new food processor. My old standard just isn’t cutting it anymore. Yes! You can make nut butter in your Vitamix wet container. In fact, I think that is the one they recommend using….or at least that is the one I use. It makes nut butter in 3 minutes. I found that the small (32 oz) container does a better job at it than the 64 oz. And, another secret….turn up the speed slowly before flipping to high. Happy grinding! My mom’s VitaMix is REALLY old school and there wasn’t even such thing as a “dry container”. She makes peanut butter in it at least once a month so I bet you’d be fine! The only nut butter I’ve ever made at home was actually YOUR recipe for the dark chocolate almond butter! I’ve made it twice, and the first time it was seriously the. most. amazing. thing. ever…. I ate so much of it straight and drippy from the processor that I barely had any left to stick in the fridge and get to that amazing ganache-like texture! The second batch I think I messed up the proportions and my processor kept trying to jump off the counter, but it was delicious anyway! haha yikes! processors can be crazy at times. Glad you enjoyed it! I love Ashley’s blog! These pictures are amazing! How fun to meet your blog buddy in person!!! And wow…I’m seriously regretting the jar of almond butter I bought yesterday. I’m sure it’s NOT NEARLY as delicious as your home made version must be. 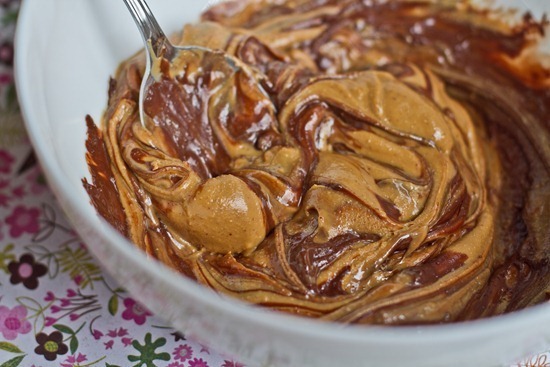 Omg this looks amazing, I just made ashleys cookie dough almond butter and was in heaven.. as far as the vitamix, ive used it to make nut butters numerous times with the wet blade and it works just fine except you have to keep tamping down the nuts which is a major arm workout, I prefer the food processor its less work! My husband would choose Skippy PB over any nut butter. There are some battles I cannot win! I’ve never made my own nut butter, but I think I will have to try. 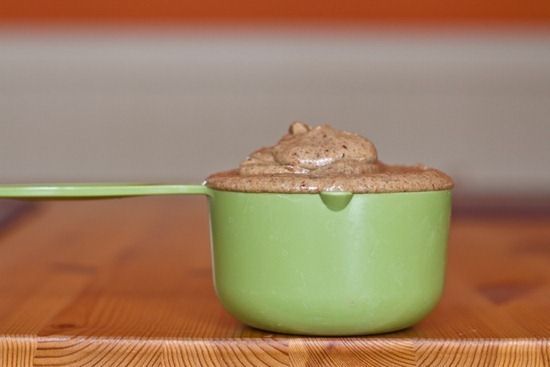 I love cashew butter and almond butter…especially when chocolate is added! That looks so wonderful! 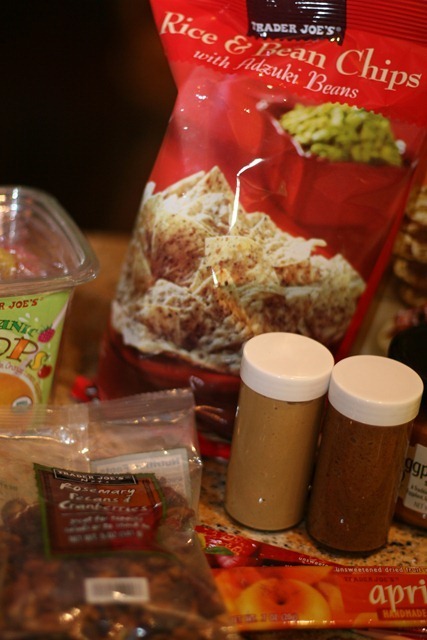 Lately I have been putting hemp seeds, chia seeds and flax seeds into everything. And my favorite nut butter right now happens to be Justin’s Maple Almond Butter. So that’s perfect! :-) I am sooooo making this. I am in desperate need of a new food processor though. I think I might have to go out and buy myself a present today! A good food processor is definitely a necessity! I’ve wondered the same thing about the Vitamix! Hopefully someone knows the answer. Awwwwww!! Brought a tear to my eye. I was just looking at the photos from our visit the other day. 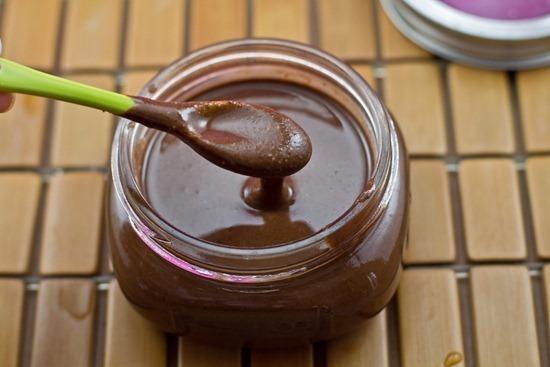 :) Your latest nut butter looks amazing! I have added flax to one of the nut butters before and LOVED it. That’s awesome that you didn’t have to add any extra oil, either. I always seem to have to add 1T when I use the maple syrup. Looks perfect though!! Wish we lived closerrrrrrr…we could totally help each other w/the reno projects! 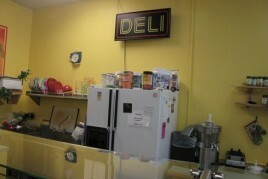 I know, the renos would be much more fun if we could blog about them together…hah. PS- I find that the maple syrup can make it really thick too (I think it is the coldness of it firming it up? ), so I added all 3 tbsp to the roasting part and didnt add any while processing. It seemed to work a bit better for me because I didnt need any oil. I’m not sure if it changes thr flavour though, but it was still tasty! p.s. i’m coming to steal your natural light! p.p.s. i was having hot flashes wondering why i decided to drive to Canada in the middle of the night, lol…border crossing at 10pm, alone..sure why not! Yes, the vitamix work! I don’t have a food processor (I know, the horror! ), and only have the regular container of my vitamix, and I make all my nut butters as well as my coconut buter in the vitamix! It works like magic, just make sure to have enough ingredients to come above the blade so it gets properly mixed, use the tamper as needed to push the nuts (or coconut) down and whiz it away, works perfectly! That was the most delicious looking post I’ve ever read. That creamy, drippy, sweet stuff is almost too much for me to bear. If I had a food processor and a bag of nuts in my office I’d be whipping up some of that goodness right now. This looks amazing! I want to make all your nut butter recipes– but I have one question (and sorry if it sounds silly!) but I only have a blender (not a food processor or super awesome blender). Is it possible to make the nut butter in it? I’m assuming it’s possible, it’ll just take longer? I’ve heard it is possible using a Vitamix, but I don’t think it would work with a normal blender. Some commenters above even said it was tough with a Vitamix. Aw, that just means I get to invest in a good food processor;) Have any advice on a good brand? I use a 12 cup Kitchen aid and it works pretty good, although not flawless. 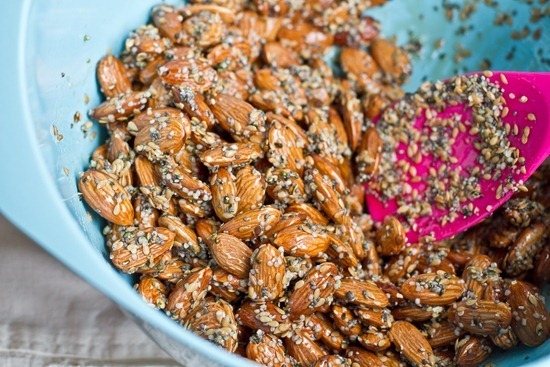 Such a good idea to cook the other seeds with your almonds! And what a nice tribute to Ash! You can use the wet blade to make nut butters. I do it all the time. The cd I got from vitamix made it in wet blade so don’t be scared! I’m definitely going to make this today! Yummy! OMGOSH! Looks tasty! I need a food processor STAT!!! Do you make homemade Jam? Or what kind do you get? …I have no idea if my comments are even showing up…I don’t think they are..
Nope, that was just store bought PC strawberry jam. Love that stuff. I checked my comments and I didnt have any in my spam for you, although occasionally I will miss some. I love nut butters!!! YUM! Ashley has the best nutbutter recipes! This looks delicious. Yea, it’s absolutely no problem making nut butters in the vitamix wet container. I’ve done it for almond, walnut, and peanut butters before. That said, a food processor is better than the vitamix just for ease of cleaning. It takes a while to scrape all of the nut butter out of the vitamix; it’s so much easier to take out the blade of the food processor and gather up every last bit of the butter, or so I imagine. I don’t have a food processor, so I stick with the vitamix. This looks delicious, Angela! 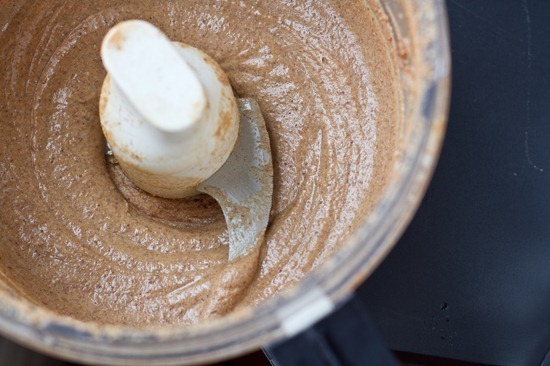 I’ve made nut butter in the wet container of my Vitamix many times, and it worked just fine. I had to keep it at a low speed for much of the process and keep pushing down with the tamper, but it came out really smooth. I’m totally inspired to try new ad ins now! I’ve been debating getting a small food processor. I used to have a food processor attachment on my blender, but then my blender broke and I replaced it with my Vitamix. Do you think it’s worth it to buy a food processor if i already have a Vitamix? What kinds of things to do you think are better done in a food processor, if any? Wowww~Delicious! I have made nut butters at home many times, but they never come out creamy like that b/c of the processor i think. But maybe I just didn’t process as long as I should have? I can’t comment on your processor…but I can tell you that I am sometimes tempted to stop too soon, but if I process a couple minutes longer, it become soooooo drippy. I think it is because the machine also heats it up a lot as it processes! The blade was SO hot I almost burned my finger on it! Ohhh my gosh goodness gracious. Those are my four favorite ingredients in the whole entire world. I am making this now!! Hi Angela – when I bought my vitamix at the home show the rep told me I could make nut butter in it. I only have the wet blade. He told me the dry blade was if you were grinding your own flour. I haven’t tried it yet though. The posts of you and Ashley. I remember those! It feels like a lifetime ago…and just a minute ago. I would love to meet both of you! what a great idea! you are so creative, it continues to amaze me! I’d love to try this recipe- thanks for sharing it! 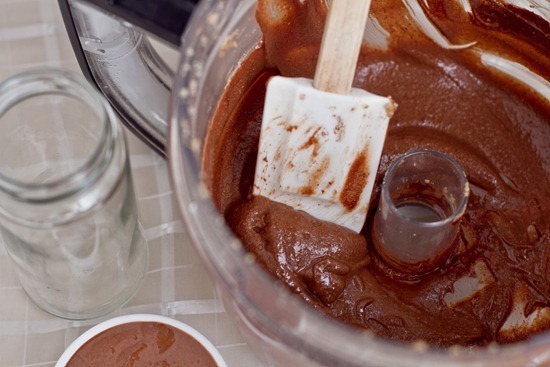 How long can you keep homemade nut butters? I think we’ll eat this one far before it’s expiration date!! I would guess they would keep as long as store bought natural nut butters. Ive never had one go bad on me before. I would guess at least 3-4 weeks. Where do you get those teeny mason jars, they are too cute. Must find some soon. I’m in Ontario, do you usually find them at the grocery store??? Oh boy I could just dive into that! Oh my goodness, hemp, chia, almonds, and flax? What a nutritional powerhouse nut butter this is indeed! I am SO on it when I find some free- time in my busy schedule! Good call on ingredients! I have two recipes from the vita prep cookbook, if you want to send your email to me I can scan them and send them off to you. One is hazelnut and the other is peanut or cashew butter. Thanks Jennifer! I think I have the cookbook you speak of, I will have to check! I’m sorry I can’t answer your question, but I do have some rather ground-breaking news: I finally got around to making my own coconut butter. I used my plain jane Oster blender, and it did a pretty great job. I wanted to make your vegan macaroons for a party this coming weekend, and am relieved/happy that the first step worked out so well. I have heard such great things about the Oster! I miss my almond butter! I’m with Eric, I HATE nut butters, peanut, soynut, almost – you name it – what is wrong with me? I enjoyed the post nonetheless, I just cannot get excited about ground up gooey nuts! I’m dying to make my own almond butter but I’m not sure if my food processor can handle it. Do you think a small 3-cup Cuisinart will do the job? I have never made my own almond butter because I don’t have a food processor … but this recipe is reason enough to go and buy one! Oh man, I came buy to drool over the nut butter again before I leave work for the day (I’m sad) and I read a little more closely about the hubs coming into the kitchen. I read “I pity the fool” and totally laughed out loud in a dead silent office. Nice. 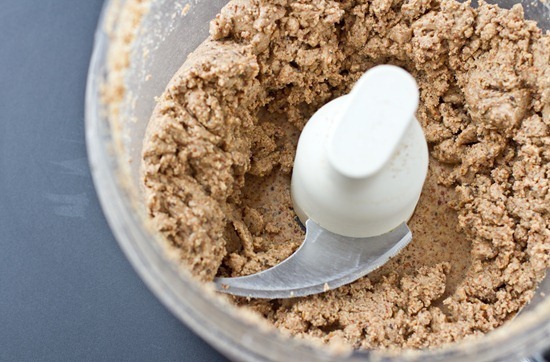 You can use the wet container to make nut butters with your vitamix. Just so you know, in the Vitamix recipe book, whenever you need to use the dry blade container, it is specified in the recipe. It is not specified for nut butters. 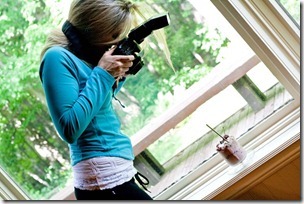 There is an online demo on the vitamix site (can’t see the blade tho’), you may want to check it out. Good Morning! This might help you to clean your Vitamix. Whenever I make something “gooey” that is hard to clean I put a few drops of dish soap and fill about a quarter of the way with water. Then I put the blender on high for about a minute or so… VIOLA! CLEAN! Great photos, keep it up!!! After reading the pasta post where you mentioned that Eric “forgot” to eat lunch, and now reading that he hates nut butter…I think I’ve come to the conclusion that he’s nuts (pun intended). Your nut butters look more amazing than any others I’ve seen! I’m afraid to think about how much nut butter I would eat if I lived in your house. 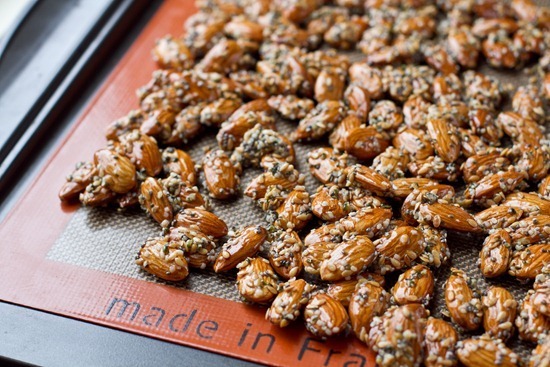 By the way, those almonds look like they’d be a yummy snack straight from the oven! I just read your posts of your visit with Ashley, how fun! The nut butter sounds amazing! I will definitely be making this as soon as I return from Florida :) Your recipes have inspired me to try vegan diet for a week. I never realized the vast variety of vegan food! If you are ever in upstate NY, I would love to meet up with you! Thank goodness for you + Ashley! You have both saved my life with these nut butters – not to mention my wallet! Naturally Nutty’s is my absolute FAVORITE nut butter around because of the smooth yet gritty texture, but at $8.99 a jar, they’re a little pricey. I will need to go pick up some hemp seeds to try your recipe out! Thanks for all your amazing recipes! 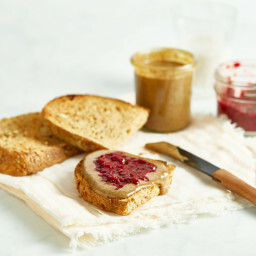 Okay, I’ve GOT to replace my burned out food processor so I can start making some of these delicious nut butters! I can imagine how much fun the cleanup was. 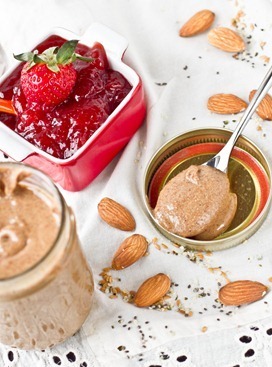 This nut butter looks tasty + delicious! 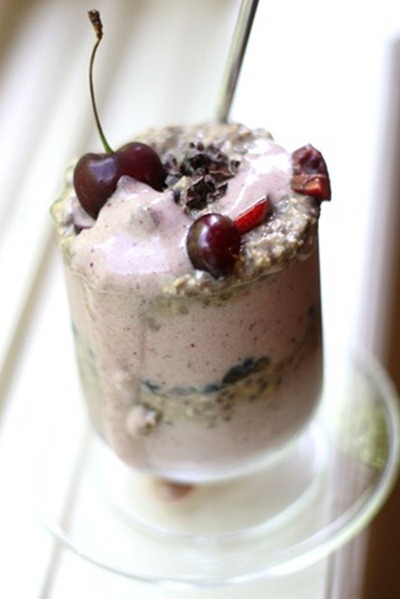 I love adding flax to my nut butter to give it some crunch but I’ve never thought to add chia! I didn’t read through all the comments (119!) so I’m assuming you already got your answer, but just in case you didn’t, YES you can make nut butter in the wet container of the Vita Mix. Actually the recipe book it comes with recommends using the wet container, not the dry. I always use the wet. This nut butter looks amazing!! All of yours look amazing. Some of my closest friends are women I’ve met through blogging, so I know the amazing feeling of really connecting in person for the first time when you were a bit nervous! Also… this nut butter…. YES YES YES. Anywho, that almond butter looks heavenly! LOVE your blog!! I make EVERYTHING in my Vitamix. I only have a “wet” container and all dry ingredients do fine. I just make sure that I mix all my dry ingredients first and set aside, if necessary. You can have nut butter in seconds! Just use the tamper that came with the blender to push down the ingredients to keep them moving. I’ve had my vitamix for almost 6 years, it was the BEST Valentines Day gift my hubby has ever gotten for me!!! I’ve never tried making my own nut butter which is silly considering nut butter is really difficult to find where I live. I guess I always thought it was really complicated and difficult to make! Thanks for sharing, I will have to try this – it looks pretty easy! 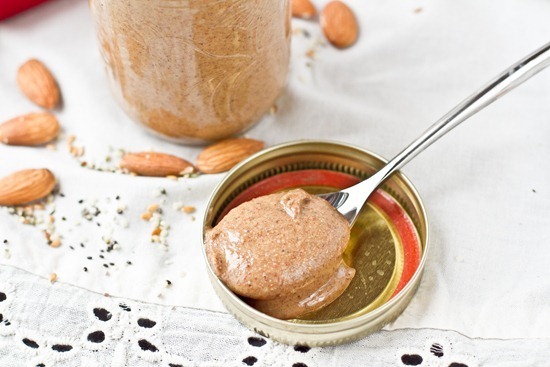 This maple almond butter looks so good and makes me want to step out of the box a bit and try and make my own. YUM! I don’t think you need a dry blade for the vitamix to make nut butter. I don’t have a dry blade although I have made “cookie dough balls” (all dry ingredients; cashews, dates and all) and it was totally fine! It was a bit scary because it made a bit more noise but there was no problem. I was worried.. actually scared I was going to ruin it too.. BUT thankfully it didn’t! If you try it, please let me know how it works and maybe i’ll try my own. Wow, this sounds and looks amazing. I don’t have a food processor and am afraid to try making nut butter in my blender. At least I can drool over you pictures! Seriously, it’s probably my all-time favorite food – I’m not sure I could live without it!! I love that I posted my own Cinnamon Maple Almond Butter inspired by Ashley on the same day as your fantastic post. I think next time we should just make a double batch together and share the clean-up. I just made this and OMG! This is so good!!! Getting ready to cut up some apples as we speak! It was so easy and so yummy!! Thank you for sharing the recipe! I am enjoying your site! Lots of great recipes!!!! Could I make this with pre-roasted almonds instead of raw, and a mix of honey and golden syrup instead of maple syrup? Maple syrup isn’t readily available where I live. I would guess that yes you could substitute those ingredients, but I’m not positive since I have not tried it before. Goodluck! I just made this almond butter a few minutes ago and i am enjoying it with a banana right now. AMAZING! Mine didn’t turn out quite as creamy as yours, more like a paste, but who cares when it takes this delicious! Thanks for the great recipes! I always look forward to seeing what you come up with! I made this almond butter yesterday and it’s absolutely amazing. i didn’t put the cinnamon though, thought it would take away from the maple syrup. Love your website Angela, lots of great recipes and great pictures, i’ve even made your website my home page! I am sitting in front of my television dipping my scraper into my vat of almond butter and licking away. SO DELICIOUS! Thanks Angela! i dont get it, i have a kitchen aid food processor which looks just like this one and i processed it for 20 minuites and it has barely done anything exept get stuck ever 2 seconds!!! im pulling out my hair, what do i do? definatley NO butter in sight! 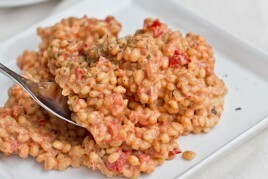 I’ve made this recipe many times :) LOVE it!!! How do you store your nut butter? In the pantry or do I need to refrigerate? How long does it last? Thank you for answering my questions! Can’t wait to try the recipe! I don’t have any hemp seed, do you think this would work without it? yes for sure! Just make sure you use a heavy duty processor as smaller processors sometimes can’t make nut butters. I made this this afternoon in my Vitamix, and it is AWESOME! I have one question though regarding making your own homemade nut butters: How long do they last? Should they be refrigerated? I look forward to checking more out on your blog! You have lovely photos! Hey Natalie, Yes for sure put it in a container in the fridge. It will last for a while- at least 2-3 weeks if not longer. Enjoy! I just made this delicious nut butter, and then I added it to some of the banana soft serve I made…yummy! Quick question…is it better to refrigerate the nut butter or not? Thanks for yet another awesome recipe! I just made this and it is delicious!! It is my first homemade nut butter ever and I am very impressed. Of course I knew your recipe wouldn’t fail me, I have so much success with all of your recipes! Shoul this be stored in the pantry or in the fridge? I “made” this with raw almonds. I don’t know what happened but it NEVER turned into almond butter. Hours and hours in the Cuisinart, still a lumpy, greasy mess. On the bright side, though, I found that that lumpy, greasy mess made the most EXCELLENT little Tootsie Rolls. Yes, you definitely can use the wet container of your Vitamix. In fact that’s the one you’re supposed to use for nut butters. Roasting helps the almonds release their natural oils, thereby making a more successful and quick nut butter. I finally bought dry roasted almonds, no salt, no added oil. After numerous unsuccessful attempts at making raw almond butter in a food processor and my vitamix, the dry roasted almonds were like a miracle! Delicious, creamy and warm almond butter in my vitamix super fast, probably under three minutes. Yes, you do use the tamper and it’s a good workout for your arms, but oh so worth it! I just made this maple cinnamon almond butter and it’s AMAZING. I normally don’t like almond butter, but this one is a keeper. yum. Vitamix: I make nut butters in it all the time. Typically cashew or sunflower which are softer, but i add melted coconut oil to it to aid the blending process which make my vitamix should less like its dying. 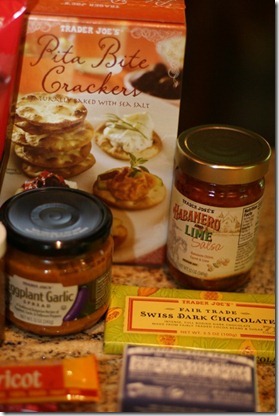 I know this is an older post, but in an attempt to make yummy, not full of sugar vegan presents, I gave this recipe a whirl. Delicious! I am labeling it hippy almond butter (because of the hemp seed- and to be funny). Also, I start all almond butter in my (wet)Vitamix pitcher (to crunch everything evenly) then process in my cuisinart. It’s more to clean but doesn’t overheat the food processor as much. Plus you can make a smoothie after too. Thanks for your creative recipes! All the best!! So I made this delicious recipe but did not have a food processor strong enough. It never really turned into butter. What it did make is an amazingly delicious sprinkle for my overnight soaked oatmeal and yogurt. Absolutely wonderful. I know this is an older post, but I have been trying to make almond butter at home (for a couple years) and it has not turned out at all. I have a regular food processor and an 800W blender. I had tried the processor on several occasions and it would puree the nuts, but would go no further with them. So this time I started them in the blender and it whirled them until they stuck to the sides of the blender and the blade simply spun around without touching the butter. So I transferred the goop to the processor and whirled away. I worked on the mess for 3 days (not a total of 3 days, but as time permitted). I finally got the nuts to form a ball, but the processor got so hot you couldn’t touch the base and every time I took the lid off to stir the nuts, smoke came out. My almond goop never got smooth and creamy. It was like a playdough paste and would go no further. Is that because I don’t have a powerful enough processor? Or was i doing something incorrectly. This got so frustrating I finally gave up. Thanks for any tips you can offer. LOVE THIS! I tried to make it today and it wasn’t turning into a creamy paste and was so dry. I used dry roasted almonds, may be it’s that? So I just added 1/2 cup of almond milk and kept spinning and it finally turned out the way i like it. I made this almond butter and it is to die for! My husband can’t get enough and my friends keep bugging me to make more. I will next try the 4 ingredient chocolate almond. Thanks so much for sharing your recipes, can’t wait to see what you come up with next. If I only have ground flax can I use that? If so, how much do I use? I’ve been trying to make the Almond Butter in the food process0ror but even tho the blend was steaming, it is still crumbly and won’t hold together. Can you tell me what I’m doing wrong? I processed it for at least 15 minutes. Hi Elaine, Sorry to hear that! What kind of food processor are you using? I find smaller machines don’t always work. I use a heavy duty 12 or 14 cup processor by Cuisinart and it works every time. Hope this helps! I have made this a number of times. The only time it actually “worked” and looked like creamy almond butter whas the first time. While it always tastes delicious, every other the almond butter doesn’t stick together. I have pureed it for up to 20+ minutes. Any ideas? Thanks so much! I tried this receive twice but couldn’t get to look how it looks in the picture so I have two questions? 2. And how do I get liquid constitancy? I have ran the food rocessor for about 15 minutes and it was still a bit hard not the kind I see in the picture. New to all this. Just overhauling my diet. 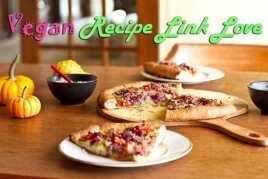 Love the recipe and your site. How long will this keep in the refrigerator? Just made the maple cinnamon almond butter and the dark chocolate almond butter. So easy and so delicious. Bringing first batch to my daughter in college. Second batch for me. Would make a great Christmas treat/gift. Thank you! 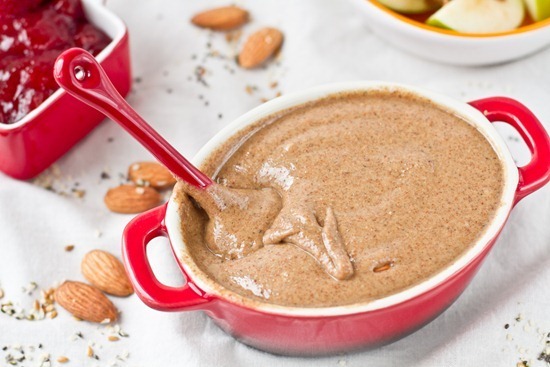 Angela – This maple cinnamon almond butter is out of control good! It was my first time making nut butter, and as I sit here licking the bowl i know i’ll never get store-bought again. Thank you!! Looks fantastic! I want to try to make this for my boyfriend’s mom as a Christmast gift. Can you use ground flax seed in place of whole? Awesome recipe! How do we store it? At room temperature or refrigerate it? Hi Cindy, I store it in the fridge in an airtight container. 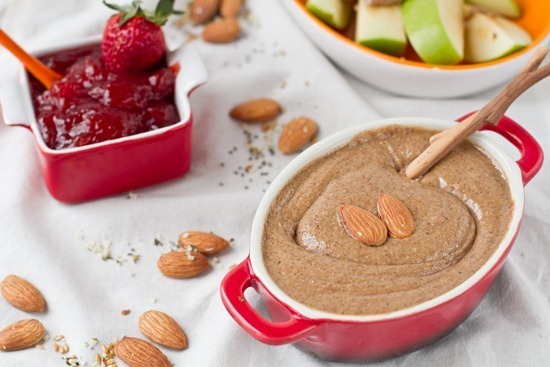 Thank you very much for sharing this awesome recipe, been searching for a good almond butter recipe, this look like the one. Hi Yvonne, I hope you like it if you give it a try! Always looking for a bit of sweetness to add to my lunch, and this coupled with sliced apple totally did the trick. LOVE IT! After poor results for this recipe from the Oh She Glows Cookbook I came online to see if I could read some comments from anyone suffering from the same thing. I just couldn’t get my butter to be creamy. The problem became clear on this site .Upon reading the ingredients here, 1-2 tablespoons of coconut oil is called for, in the book 1-2 TEASPOONS. Big difference to be sure even considering here there is flax,in the book there is not. As usual most comments were about how great a recipe sounds and not how good it tastes. For those of you who are having trouble with this recipe and are fortunate enough to have both a good quality food processor and a high speed blender, I found a solution. So I am a boring and predictable person who likes routine, and one of my routines is having a piece of sprouted bread with some sort of nut butter (and sometimes some chia jam if I’m feeling crazy) for a snack every day. So, suffice to say I have made my fair share of nut butters over the last few years. This one was the most stubborn and difficult one I have ever made. I processed it with a full tablespoon of coconut oil until I feared the death of my processor. It got liquidy but not smooth – still chunks of nuts and seeds throughout. I tried to let my processor cool down and give it another go but I guess I had WAY overheated it. And then I spied my Breville Boss. With about 30 seconds on the “Blend” setting (it’s a medium speed setting for those of you with Vitas and Blendtecs etc. 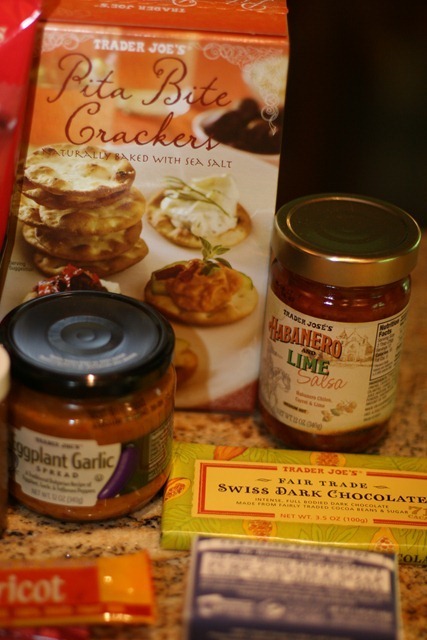 ), I had the smooth and creamy consistency pictured above. This looks great, and I think I’m going to make this as a gift for a friend. How long do you think this would keep? Hi Robin, Oh, I hope your friend loves it! What a lovely idea for a gift.  Stored in the fridge in an airtight container, it keeps at least a month. Hi Angela, I make almond butter all the time in my wet vitamix container and I always have to add a little bit of coconut oil to get it going well, but once it is made, the oil goes to the top and I drain it so that I don’t have too much oil. It always turns out great. I am excited to try your recipe in my vitamix. I need help. this totally seized on me! I sprouted and dehydrated my almonds and added to vitamin with 1/2 Tablespoon coconut oil and 3 T maple and the almonds got super creamy/blended – but it’s still a weird consistent with pockets of oil/liquid. Can’t get it ymmy and smooth, anyone else having issues? Hey Carol, Water tends to make things like this seize. Is it possible your almonds weren’t fully dehydrated? 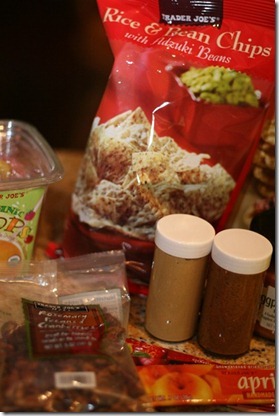 I have never tested this recipe with sprouted and dehydrated almonds before. I think when you cook it – it turns into sugar and not a liquid and therefore doesn’t seize. But if there is additional help please let me know! Also – I SEE YOU POSTED WITH MY FULL NAME – please remove just my first name please – did not realize it would be published this way!!! Thanks!!! I just made this in my vitamix with out the dry container. Worked just fine. And the almond butter was delicious! I made this today but it came out so much darker looking than yours. I had flaxmeal on hand and used that instead of whole flax seeds. Maybe that is why? Besides that, it is absolutely the best nut butter I have ever smelled or tasted! I’m so glad you love it even if it turned out darker :) Enjoy! I also love to make the brown rice crispy squares, but can’t find the brown rice syrup anymore in Ontario, do you know where to get it, or what I could use instead. I was told this is discontinued? Love all your recipes, keep up the great work!! Hi Leanne, Yes it’s out of stock everywhere…I think it was a recall (because no one has it on the shelves), but apparently they said they are “changing packaging”…it’s not expected to be available for 2 more months. :( I am ALL OUT and missing my glo bars and crispy squares! lol.